One of the easiest musical instruments for a person to make at home is a drum. 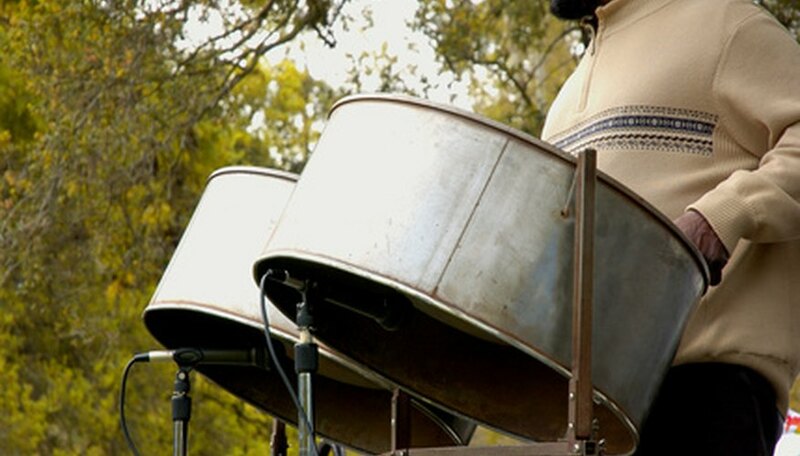 A drum is basically a hollow tube with a tough covering that is struck to produce sound. Plastic is very suitable material for making that tough drum skin. It is pliable and durable; in fact, many synthetic drum skins are actually made out of complex plastics. You can create a strong drum skin out of household plastic items. Fold the tarp in half two times to create four layers. It does not matter how large the tarp is, you will only be using a small section. Place the round container (which will serve as the body of your drum) upside-down on top of the tarp. Draw a circle on the tarp surrounding the container, but also 2 inches larger in diameter than the container (the skin will need to be larger than the head of the drum to allow for mistakes and stretching). Spray a thin layer of adhesive on one of the tarp circles. Place a second circle on top of the of the first. Repeat with the remaining two circles and let the skin set and dry for two hours. Punch holes spaced 1 inch apart all around the edge of the drum skin you created in the previous section. Loop the shoestring or rope through these holes in the drum skin in the same manner as you would weave a needle through fabric. Place the stringed drum skin over the top of the large container. Stretch the drum skin as tightly over the top of the drum as possible while simultaneously pulling the ends of the string tighter. You may need another person to help with this. Tie the two ends of the string together with the drum skin pulled as tight as possible. Place the drum skin over the top of the large container. Place large rubber bands around the skin while pulling it down tightly. You may have to cut some of the rubber bands and tie two together to fit the large container. Use enough rubber bands to tightly secure the skin to the drum. Screw in the eye screws all around the sides of the drum, going through the skin and the plastic container. Use a nail to make guide holes if necessary. Use enough eye screws to tightly reinforce the rubber bands and secure the skin. If you do not have an old tarp, you can use an old pleather couch cushion or even strong trash bags to make the drum skin. Use eight layers instead of four if you use trash bags.